"Large trolley bag that can also be used as a backpack. Made with 300 and 400 Denier fabric that is light and very strong. The main compartment opens on three sides allowing easy access. There are two large bellows pockets in the front with zip closures, two side pockets for fins and a small upper pocket that holds an address tag. There are also two adjustable, padded, straps for carrying on the back that can be placed in special pockets when the backpack is being wheeled. The reinforced pull handle is telescopic and fully retractable. The wheels have a large diameter and can be removed and easily replaced in the event of breakage. There are two carrying handles: a reinforced one at the top and one with Velcro closure at the bottom. The back of the bag houses supporting rods to keep the Moby 5 in a vertical position. All the zips are very strong YKK. Made in Vietnam." 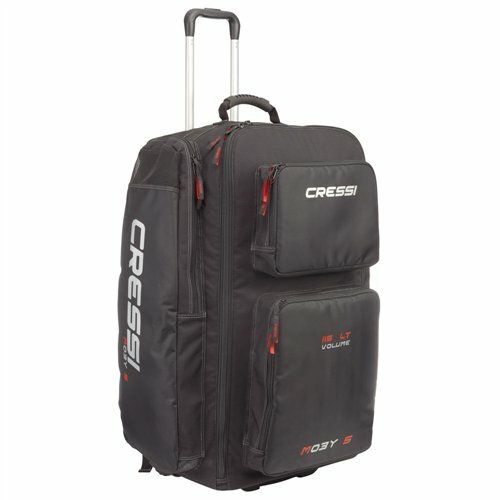 Large trolley bag that can be used also as a backpack. Made 300 and 400 Denier fabric that is light and very strong. Capacity of 115 liters (4 cubic feet). Perfect for carrying any kind equipment. The main compartment opens on 3 sides allowing easy access. 2 large bellows pockets. 2 long side pockets that can holds a pair of fins.